Over the years, CZ-USA has built a solid reputation in the hammer-fired pistol market. That kind of happens when a company conjures up a classic, such as the CZ 75. But the Czech gunmaker is making another run at striker-fired shooters with its new P-10 C.
The P-10 C isn’t the company’s first foray into this style of handgun, but it does represent its first updated design in quite a spell. The new compact 9mm (a .40 S&W model will be available later this year) has been met with plenty of fanfare, and the above video with Gun Digest the Magazine Editor-in-Chief Eric Conn shows it’s merited. As Conn discovers, CZ put plenty of thought into how it would offer a modern variation of the pistol, addressing main user complaints of this style of handgun. Perhaps chief among these is outfitting the pistol with a dynamite trigger. Breaking at 4 1/2 pounds, it’s light and snappy. It also features one of the shortest resets available today. On top of that, CZ has put plenty of thought into the pistol’s ergonomics, designing a handgun that can be modified to fit any shooter’s hand, thus allotting more control and greater accuracy. 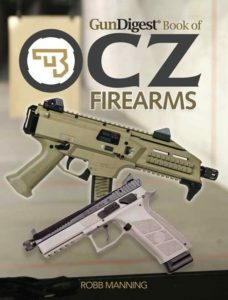 Watch the video to learn more about CZ’s P-10 C and checkout Gun Digest’s YouTube channel for more great gun and shooting videos.